Learning from Failure offers tools for learning from failure in the design, implementation, and operation of computer and information systems. Using real-life examples, it covers the causes of failure--from projects with unacceptable performance and design problems to projects that come in late and over budget--and offers real solutions that help business leaders and IT specialists learn from past mistakes, rather than repeat them. Dr Joyce Fortune is a Senior Lecturer and Head of the Technology Management Department at the Open University. Her teaching and research interests include systems failures, quality management and technology strategy. Her most recent papers have covered a wide range of topics including risk in project management, human rights and ethical policing, emergence and systems approaches to failure. This is her third book on systems failures. Professor Geoff Peters is Professor of Systems Strategy at the Open University and Chairman of UKERNA Ltd, the company that manages JANET, the UK’s academic and research network. His main research interests are failure in complex human systems and change in higher education systems. He has edited and authored books on system failures, systems behaviour, corporate universities and the works of Sir Geoffrey Vickers. 2. 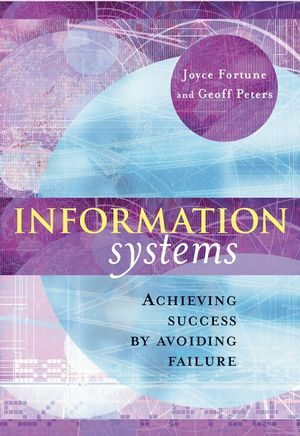 What is an Information System Failure? 6. The Systems Failures Approach Part 1: From Situation to System. 7. The Systems Failures Approach Part 2: Comparison and Synthesis. 8. Information Systems in Practice. 9. Using the Approach to Look Forward: Electronic Patient Records. 10. Other Approaches to Understanding IS Failures. Fortune Companion Site Companion site containing Exercises for students and PowerPoint Slides. Presents a proven analytical method for learning from past IT failures. Uses real-world examples from actual companies.